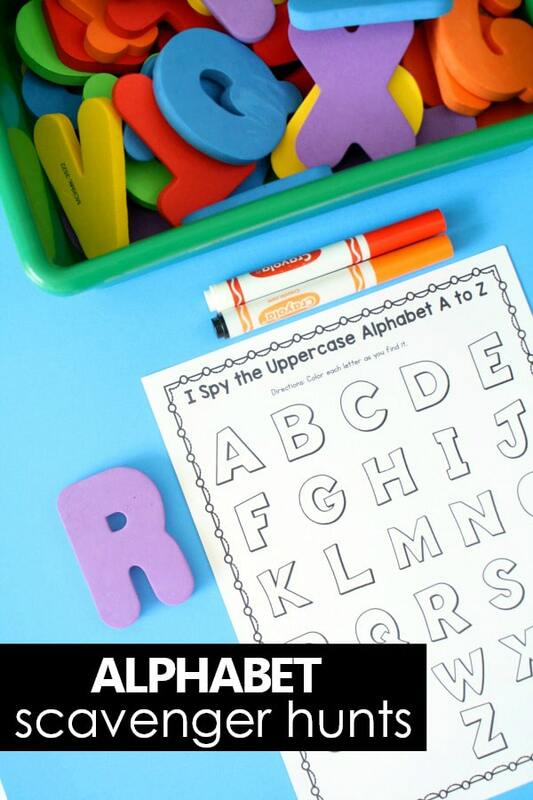 Kids have so much fun with scavenger hunts and I Spy games, so in our newest resource we’ve combined this enthusiasm with learning the letters of alphabet. 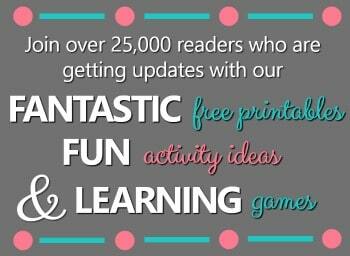 It’s a recipe for fun and tons of learning! 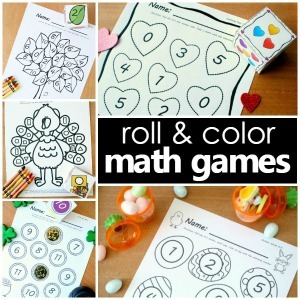 ABC games make it feel like kids are playing while they learn their letters, and there are so many different ways to play with these alphabet printables that you’ll get tons of use out of them! 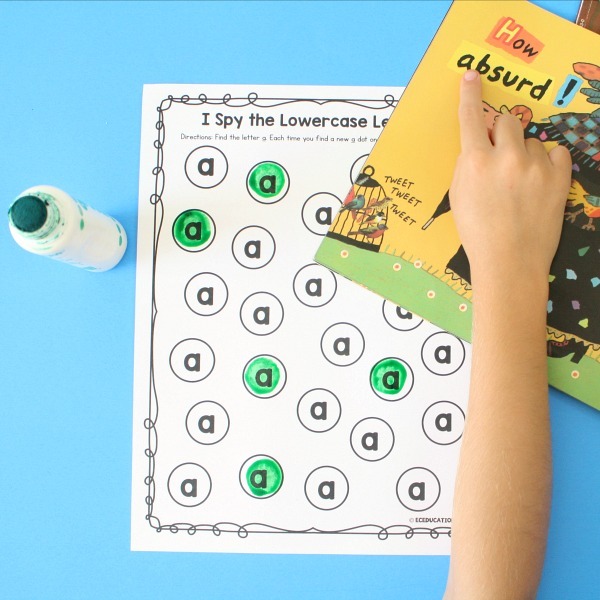 Read on to find out more about the I Spy Scavenger Hunt ABC Games Alphabet Printables, and download a free sample so you can take a closer look at the set. 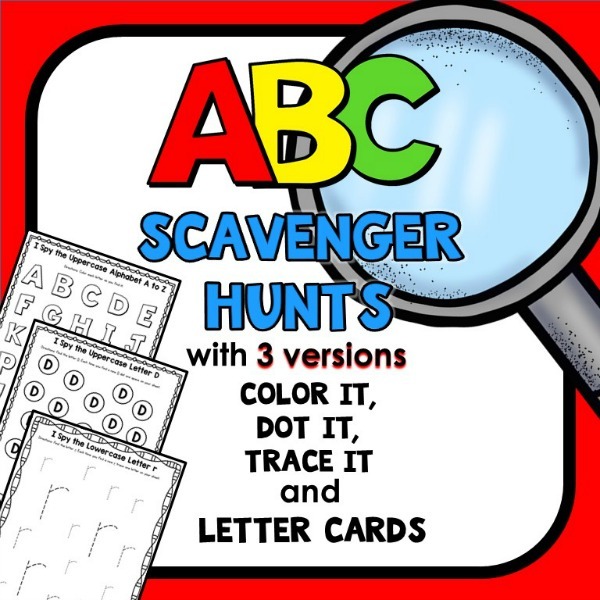 In this 229-page set we’ve included both full A to Z scavenger hunts with all letters of the alphabet, individual scavenger hunts for each letter, and optional letter cards to use with the scavenger hunts. 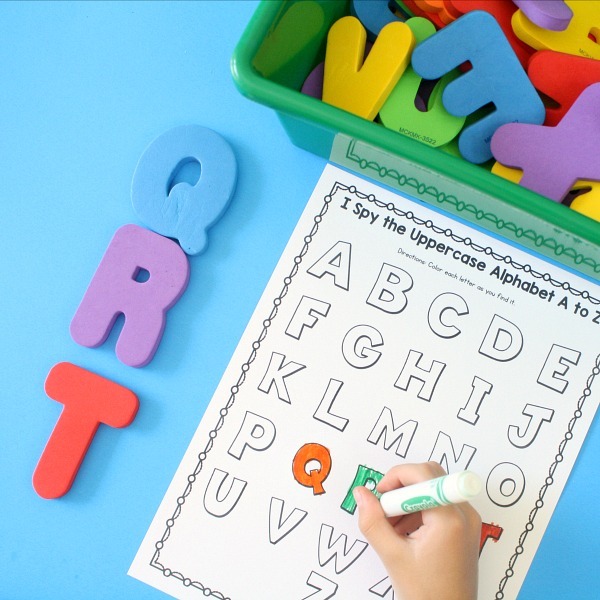 WHICH LETTERS TO USE AND WHEN: If your program follows a specific sequence for teaching the alphabet or uses a Letter of the Week approach you can easily pull the related scavenger hunt. You can also differentiate instruction by specifically targeting a letter that a child is working on learning. All students do not need to work on the same letter at the same time. When in doubt, start with the letters in the child’s name. 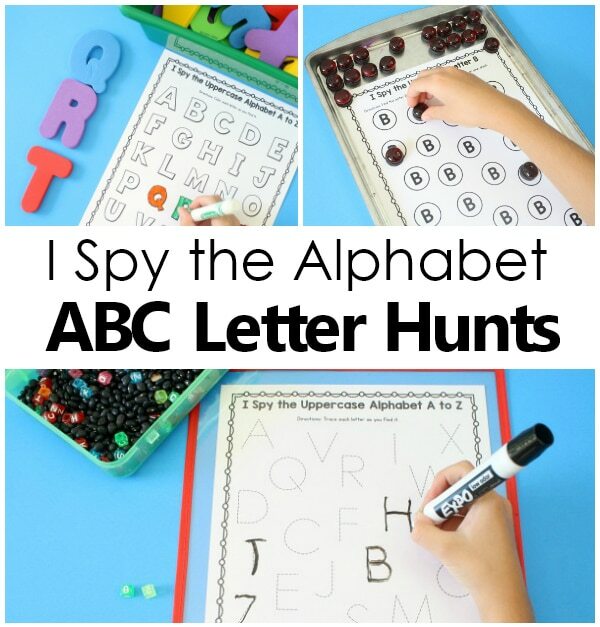 Watch this quick video to see some of the ways you can use the I Spy ABC Scavenger Hunts. Then read on for more details. These scavenger hunts can be laminated or added to pouches so they can be used over and over again and save paper. Use dry erase markers, magnetic gems (with page on a cookie tray), or small manipulatives to cover the letters. The dot it pages are designed to be used with Do-a-Dot markers or manipulatives as mentioned above. This is a way to differentiate before kids are ready for the writing practice pages. 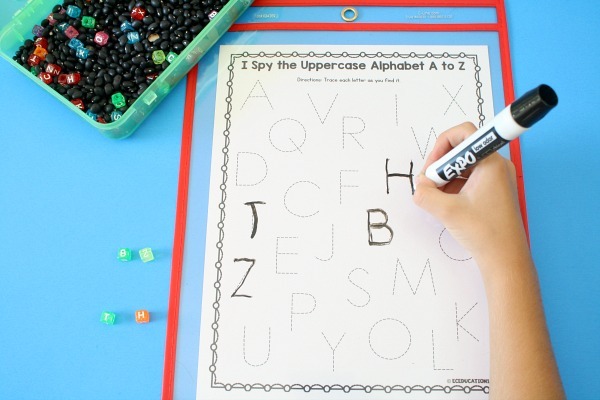 Let’s take a closer look at some of the ways we’ve been using the I Spy ABC Games. Above we’ve set up a super simple ABC center activity with foam letters, a marker and a recording sheet. Kids remove a letter, find it on their sheet, and then color it until they’ve finished the set. If you’d rather save paper and skip the coloring part, kids can also use a manipulative like a glass gem or mini eraser to cover the letters as they go through the activity. Here we’re using one of the Dot It pages on a cookie sheet with glass gems attached to round magnets. 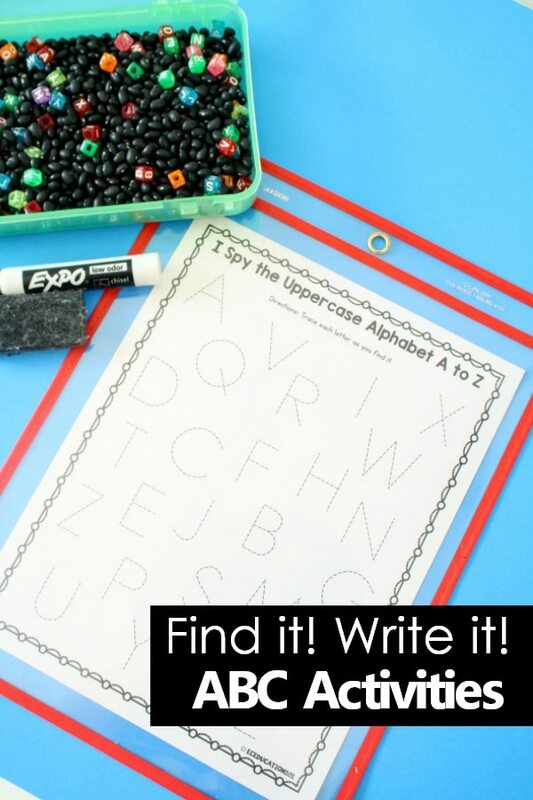 This setup works well for Read the Room around the classroom or on car rides if you’re using this at home, and it is a great for kids who are just beginning to recognize a letter but are not yet ready to write it. Kids look for the letter in environmental print (or the optional letter cards) and move a gem to the cover one of the dots on the page each time they find a new place where they see the focus letter. As kids move past being able to recognize a letter and are ready to practice writing it, you can start to phase in the Trace It pages. 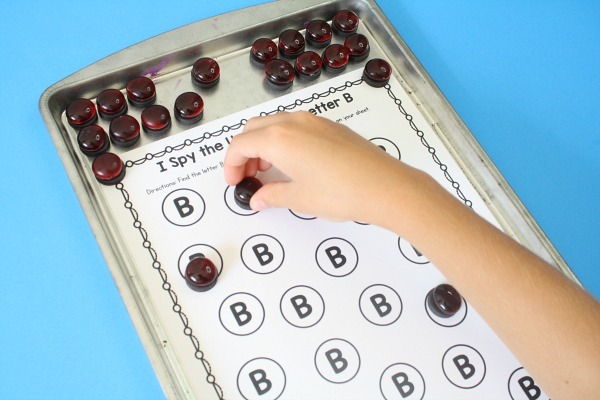 These can be used during Read/Write the Room activities as students look for the focus letter around the room in environmental print or on letter cards, and at home they make great car ride activities. 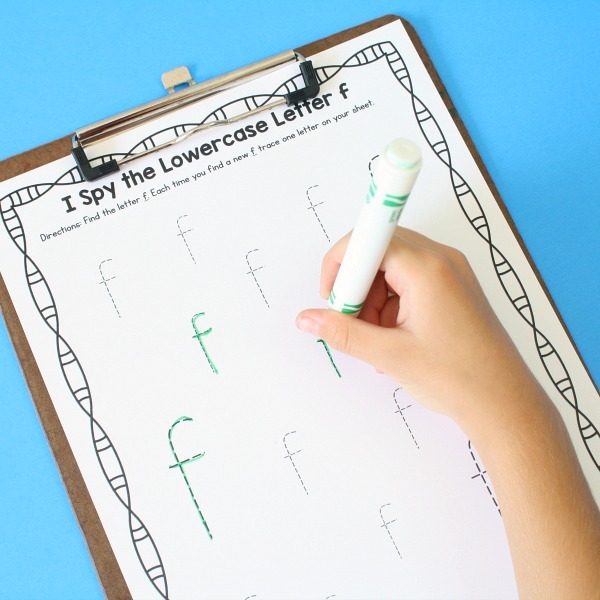 We’ve included Trace It pages for both uppercase and lowercase words. You can use them with pencils or makers, or you can re-use them over and over again by using dry erase markers on a laminated surface. 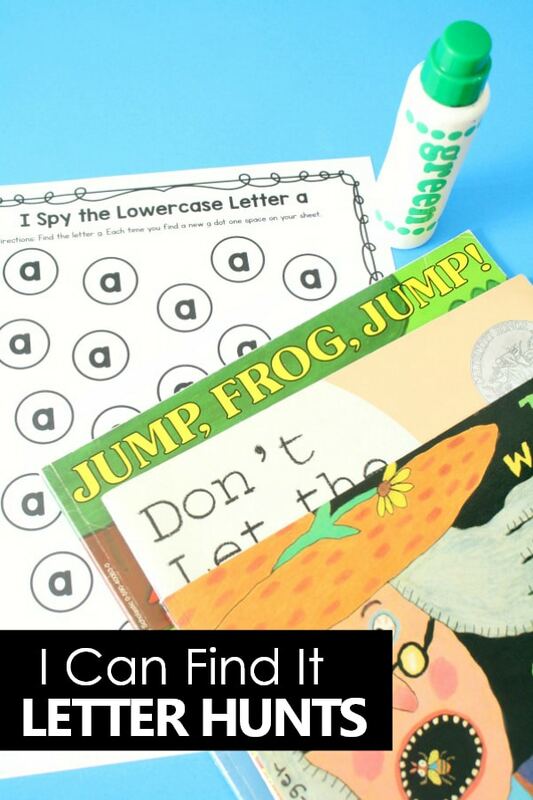 This is just a quick glimpse of ways to use these I Spy alphabet printables. If you’ve got more ideas or want to share how you’re using them in your class, pop over to our Fun and Learning Facebook group. I’d love to see what you come up with! 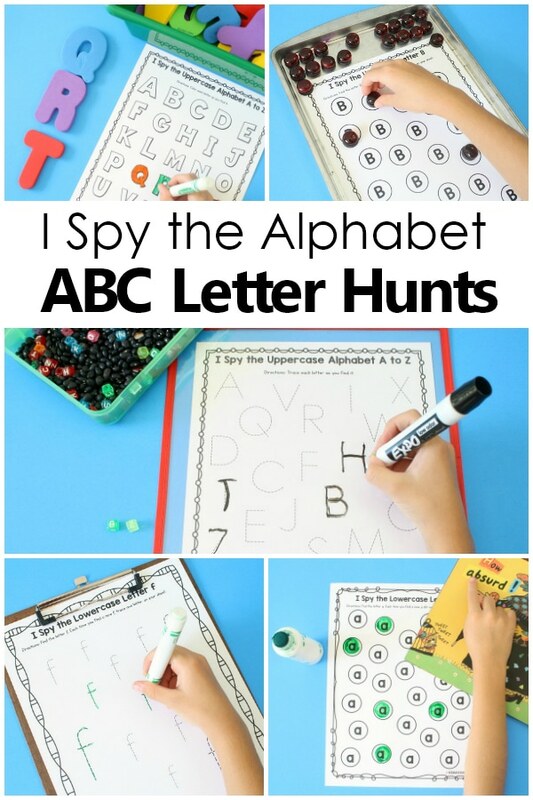 The I Spy ABC Scavenger Hunts set also includes a set of letter cards designed as an optional resource. There are various ways to use the scavenger hunts with environmental print and books instead of printing the letter cards. However, the letter cards are included as an additional option for those who would like to use them. On the individual letter sets we’ve included 18 letters each. 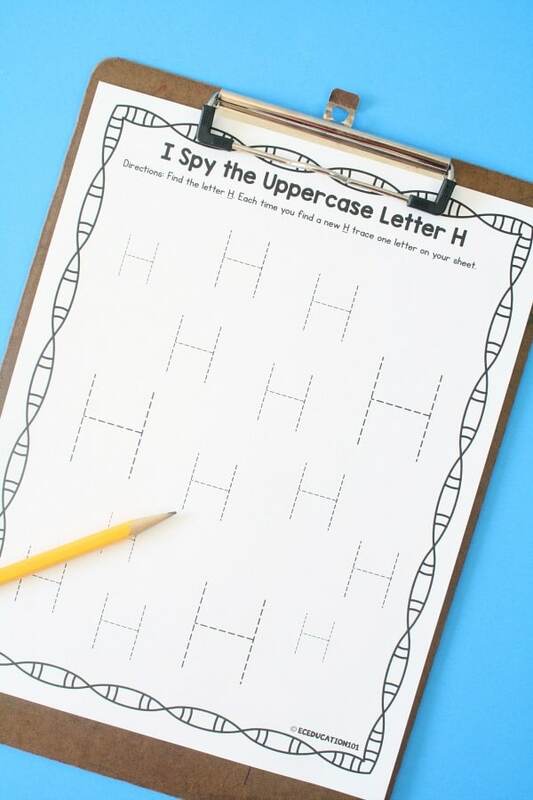 They are designed to go along with find and trace scavenger hunts which include 15 letters per page. That way you can remove any fonts you don’t like or have extras in case a card is lost. 1)Put them around the room for kids to find (they can leave them there for other kids to use or collect them and bring them to a central location if preferred). 2)Put them in a sensory bin for kids to pull from as they mark their scavenger hunt page. 3)Use them as a deck of cards face down with the full A to Z scavenger hunts and have kids pull from the stack to mark the letter they’ve found on their sheet. Get all 229 pages of the complete I Spy ABC Scavenger Hunts set in our shop or on Teachers Pay Teachers.